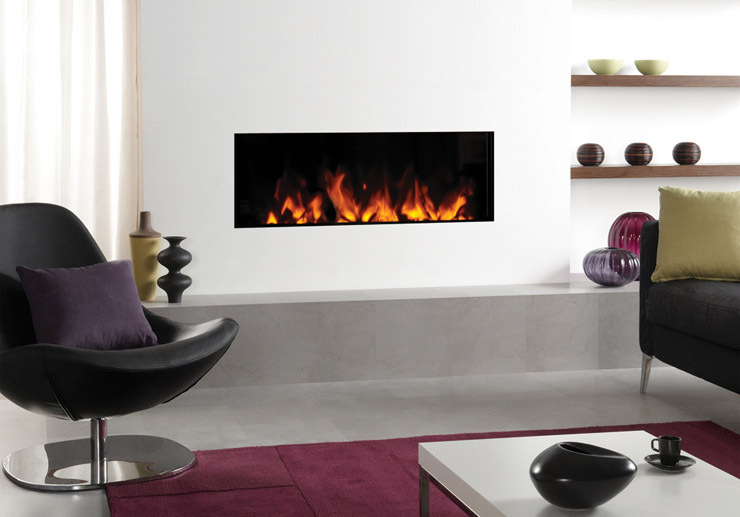 The Gazco Studio Electric Inset’s frameless design creates a strikingly contemporary and minimalist look. Available in three different sizes and installed completely flush with the wall, the Studio Electric Inset fire has the versatility to complement a wide range of stylish room designs. It’s hard not to warm to the compact, landscape form of the Studio Electric Inset fire. This electric fire is the smallest in the range and provides all the dramatic presence of a inset fire, with the proportions to suit small to medium rooms. The longer lines of the Studio Electric Inset 105 fire make a stylish designer statement in any interior. For those with larger rooms, the Studio Electric Inset 150 is the biggest landscape electric fire in the range. All Studio Inset electric fires have 1-2kW heat settings, LED flame-effect and variable brightness levels, which can all be controlled directly from your remote control, so you can just sit back and appreciate this stunning range of electric fires with complete ease. On warmer evenings you can even enjoy your Studio Electric Inset fire electric without any additional warmth as the LED flame effect can be cleverly operated independently of the heater.